We congratulate Paul Tolzman, Esq. of LeViness, Tolzman & Hamilton, on being included in the prestigious legal organization Lawyers of Distinction. 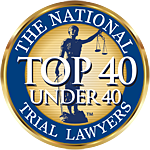 Lawyers practicing both civil and criminal law in over a dozen practice areas may be nominated to become a member. The Lawyers of Distinction selection committee uses their own independent criteria and peer and personal nominations to award membership to qualified legal professionals. Membership benefits include placement in their exclusive website directory, which is used by individuals throughout the country, as well as announcements in distinguished periodicals and media outlets such as the New York Times, the American Bar Association, USA Today, Fox News, CNN, and the Huffington Post. Members may participate in a Facebook group that networks lawyers nationwide. Among a wide variety of accolades, including status as a Super Lawyer, Mr. Tolzman has extensive litigation experience in criminal/DUI defense and personal injury matters. He is a member of the Maryland State Bar Association, the Maryland Association of Justice, and the Maryland Criminal Defense Attorneys Association. If you require legal services, call LeViness, Tolzman & Hamilton at 800-547-4LAW (4529) or contact us online to schedule a free consultation.